PROSPECT HEIGHTS in Brooklyn was designated a New York City Historic District in 2009. Now any external changes to a house’s appearance are subject to the guidelines and regulations of the city’s Landmarks Preservation Commission. No longer will it be possible for something like the crazy-quilt travesty, left, to occur. This, er, unique facade is on St. Marks Avenue near Carlton. I pass it frequently and it never fails to shock me. It’s beyond “remuddling,” a term coined by Clem Labine, the original publisher of Old House Journal. 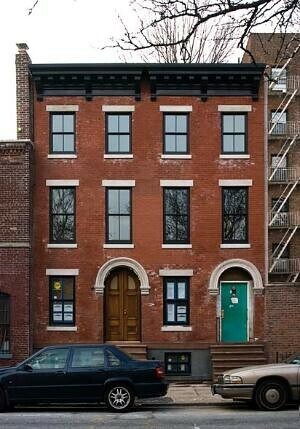 More like “radical bastardization.” Why oh why would anyone do such a thing to a 19th century brownstone? Seems impossible that someone could fail to appreciate the charms of, if not the individual house, at least the uniform row. A little light was shed on the “How could they?” question by a friend in Cobble Hill many years ago. There was a house on Amity Street with a similar ‘permastone’ treatment — I believe that’s what it’s called. The house belonged to the mother-in-law of this friend, whose husband was of Middle Eastern origin. 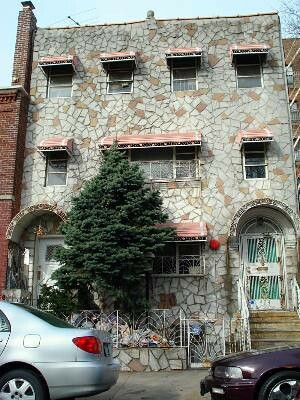 She told me that her mother-in-law had created this monstrosity in the 1950s, saying she wanted her house to look like one of the “fancy houses in Damascus.” So that explains something. I haven’t been to Damascus; perhaps the house wouldn’t look as out of context there. Today, I drove down Amity to see whether that facade is still there. It isn’t. Then I drove down Pacific, to make sure I hadn’t mis-remembered the street. It wasn’t there either (does anyone else recall that house, or did I dream the whole thing?) Anyway, I surmise the building was restored when I wasn’t paying attention, and now blends perfectly with its Victorian neighbors. Yes, the good news is that such a building is salvageable. At great cost, of course. 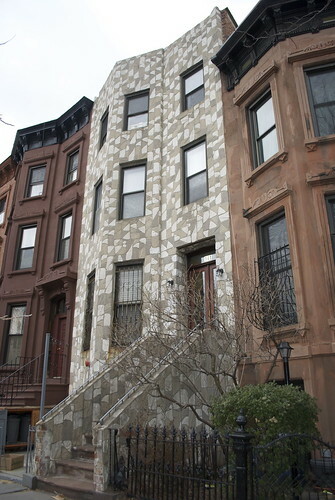 A year-old post on the National Trust for Historic Preservation’s blog tells the story of Joe Delgado, a Wall Street trader turned licensed contractor who bought the four-story building, right, in Clinton Hill in 2007. Hard as it may be to believe, the Landmarks Commission told Delgado the building had once been a carriage house. This entry was posted in BROOKLYN, HISTORIC PRESERVATION, OLD-HOUSE MAKEOVERS, RENOVATION and tagged Amity Street, brownstone, Carlton Avenue, Clem Labine, Clinton Hill, Cobble Hill, crazy paving, crazy quilt, facade, fancy house, historic district, Joe Delgado, Landmarks Preservation Commission, National Trust for Historic Preservation, NEW YORK CITY, Old House Journal, Permastone, Prospect Heights, St. Mark's Avenue. Bookmark the permalink. Very good post, but until I reread it I wasn’t completely sure whether the restored house was the one you remembered or not. ( I guess it wasn’t.) Also, can Landmarks force the owners to get rid of the offensive facade in PH? These houses though do remind me of the found art work on those houses in Philly (a la Watts Towers). So maybe there is a place for some sort of remuddling. Right, Astor, the ‘after’ in the post is the one in Clinton Hill. The one I remembered was in Cobble Hill. Good question, as to whether Landmarks can force an owner to un-remuddle a house. I don’t think so; they’re probably grandfathered in or something. Because Cobble Hill has been a Historic District since the early ’70s, I think, and the ‘fancy house’ on Amity was there later than that. There was also that Permastone one on Clinton between Baltic and Kane that I’m just now remembering, next door to a real swell Queen Anne type house. That was re-done, but I don’t know if it was because of Landmarks or just a more sensitive new owner. Also the left door seems to fit into the space perfectly and with beautiful wood, while the right door looks like a Home Depot nightmare of a rectangle squeezed into an arched space. Does that qualify as historically architecturally accurate? Well, Joe, maybe that’s where the door was originally? My guess is that he was doing such an extensive renovation anyway, moving the door would be the least of it… As for the inappropriate door on the right, I’m sure Landmarks would not approve. Perhaps the job wasn’t quite finished when the picture was taken.